Facts and history about the life and lifestyles of Native American Indians. The Native Indian Dog was extremely important to the tribes of North America. Dogs were primarily used as beasts of burden. Harnessed on wooden frames called travois, the dogs of the Great Plains transported tents, firewood and even children as tribes frequently moved to to different hunting grounds. The Native Indian dog of the Arctic and Subarctic tribes pulled sleds across the 'snow desserts'. The Native Indian Dog also provided companionship and protection to the people of different tribes. Dogs were also important as guard dogs, alerting the people to any strangers approaching their camps. The life, history and lifestyle of Native American Indians Native American Indians is a varied and fascinating subject. The following fact sheet contains interesting facts and information on Native Indian Dog. Native Indian Dog Fact 4: Many tribes considered that dogs of a sacred tortoiseshell color and a coat with a broken pattern had supernatural powers and were referred to as "Spirit Dogs"
American Indian Dog Fact 13: Dogs were also valued for their warmth. 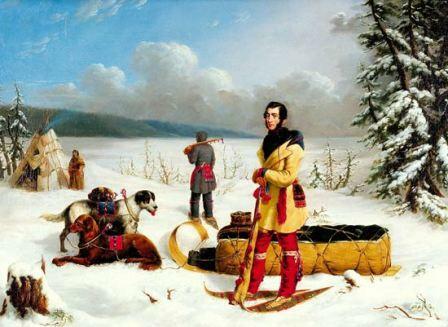 The expression "three dog night" originated with the Eskimos (Inuit and Yupik tribes) and means a night that was so cold that you have to bed down with three dogs to keep warm.